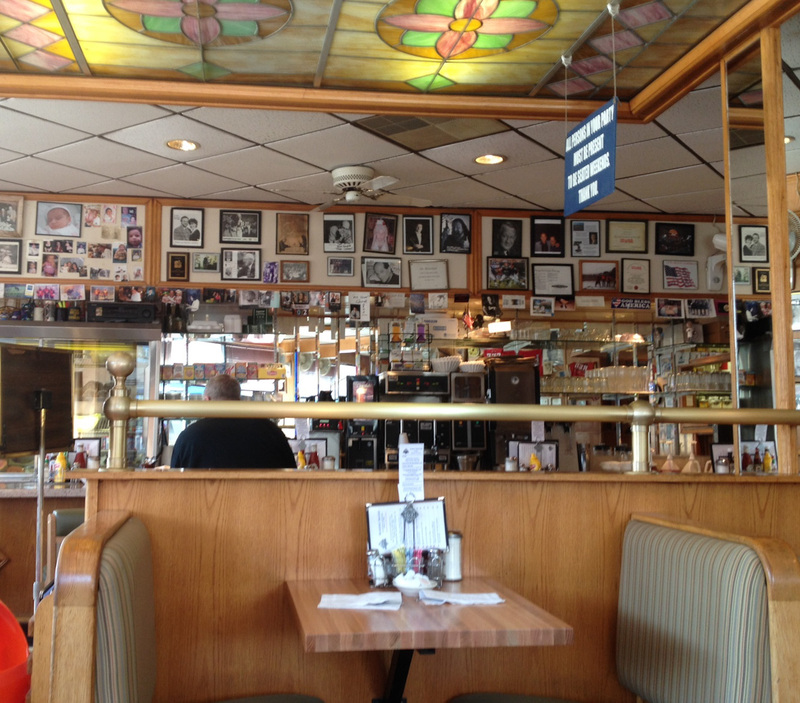 The S&G Resturant or Sam & George’s Resturant is on North Lincoln in Lakeview on the corner of Wellington and has been on the corner serving up breakfast and diner fare for over 50 years since 1957. They are open 7 days a week, which is great for us, but must be tiring for them. The tagline on their website is simple and says ‘Just Good Food’ well that was enough to draw me into a little trip over to the area via the El to Wellington and then a 10 minute walk or so across to North Lincoln, just to get some breakfast. Inside Sam and George’s it is pretty much everything that I look for and that I hope for from a neighbourhood mom and pop type of place. You have quite a few booths that you can slip into (although be warned they are kind of quite a tight squeeze), you can sit up at the counter on a stool for some solo, or sociable eating action, or you you can sit in the back room area on a proper table. It has it all. The waitresses are friendly and accommodating and most importantly it feels homely and relaxed, juts the sort of place to pop into when you need something simple and wholesome. Now I came in here specifically looking for some sort of breakfast action and that is what I found on their basic Breakfast Specials Menu. I have to be totally honest, I really don’t know how some of these places manage to survive at these prices? It can be such great value! OK so maybe you could ‘splash the cash’ a little towards the foot of the menu by ordering a plate of ‘country fried steak’ for $8.95, but one would not have to, there is plenty for around $5. Who needs Denny’s or ihop? 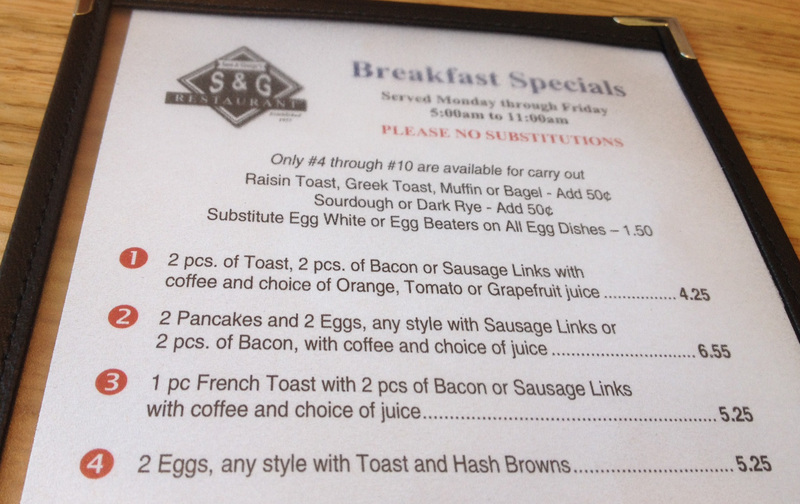 I went for the option of “Two eggs, Two Sausage, Two Bacon and Hash Browns and Two pieces of Toast” for $6.55. I know I could have scored a really good cheaper deal, but I just wanted a bit of everything on the plate and I knew I needed to keep my strength up for some serious strolling around the city looking for other places for future food hunting visits. Well that is my excuse and I am sticking to it. It was all good on the plate, decent not spectacular, but just what I was needing at that very moment. You could have your eggs anyway that you wanted them (as always) and I chose to have mine fried so that I had a nice runny yolk to mix into my hash browns. The sausage links were fine, solid and meaty, and the bacon was nice and crispy (just as I like). Did I mention that I also got a glass of orange juice as well? Most excellent! They have a lot more on the menu as well as just the breakfast plates. 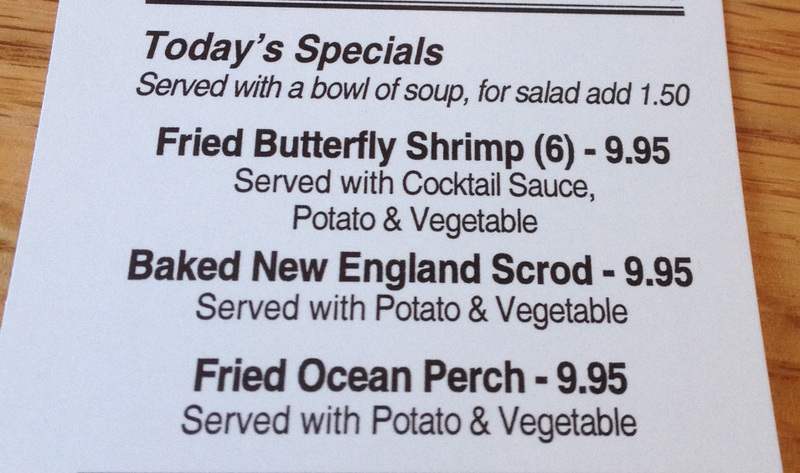 There are daily specials which seemed to be fair priced, the day I was there they were offering up Fried Ocean Perch for $9.95. 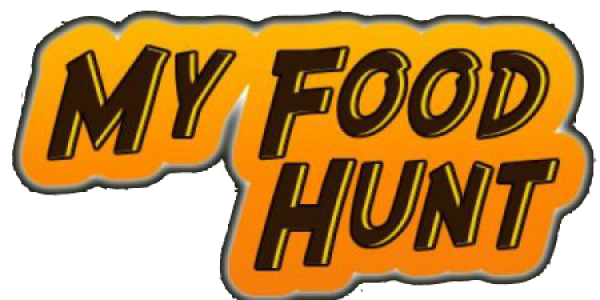 You can check out their menu online, and there is a fair amount to browse through as well, including some pretty tempting stuff. There is so much, but I have to pick out just a couple of things that I must return to try out! The first one of those is from the section that they call ‘The Melt Shop’ and that is the ‘Patty Melt’ which they describe as “1/3lb Burger Melts Between Two Slices of Cheese that Melts Between Slices of Onions, that Melts Between Two Slices of Rye for a Truly Melting Treat” did I mention that was from the ‘Melt Shop section? (not sure I needed to). The price for that is $10.95 and it comes served with ‘Lettuce, Tomato, Pickle, French Fries or Tater Tots, Coleslaw and a Bowl of Soup’. The second item is from their ‘S&G Super Sandwiches’ Section which all come with a Bowl of Soup and the same ‘Lettuce, Tomato, Pickle, Coleslaw, French Fries or Tater Tots’. The Choice from this section is going to have to be the ‘Francheezie Deluxe’ which is a ‘Kosher Hot Dog Stuffed with Cheese and Wrapped with Bacon’ for $9.95…sounds yummy. It was the bacon wrapping that did it for me. Gosh and now I am thinking about it, I am getting peckish again! I could go on and on and drool through the ‘Egg Skillets’ section, or the ‘Steak and Eggs’, the ‘Waffles’ and the ‘Pancake’ but I will be restrained and instead just encourage you to check it out for yourselves. 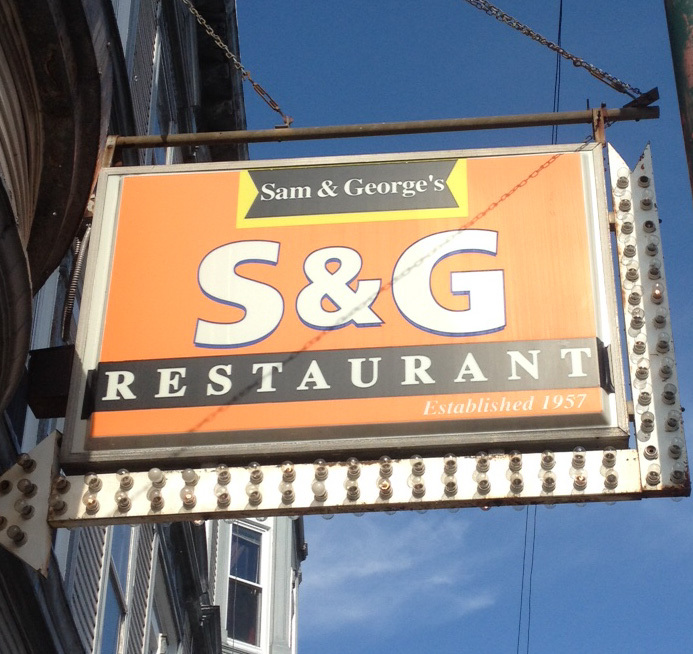 Sam and Georges Restaurant or S&G as the sign says is on the Corner of North Lincoln (3000 North Lincoln to be exact) and Wellington at a great big multi-way cross roads, so be careful of traffic. You can get there from the Brown Line at Wellington, or just take the bus up (or down) Lincoln Avenue which will probably get you closer and with less of a walk. ‘Our Neighbors Often Copy Us – But Never Equal Us! If you have the time, why don’t you check them out and see for yourselves? Enjoy! I have lived down the street from S&G for 28 years and honestly much prefer Golden Apple which is kiddy corner from them. 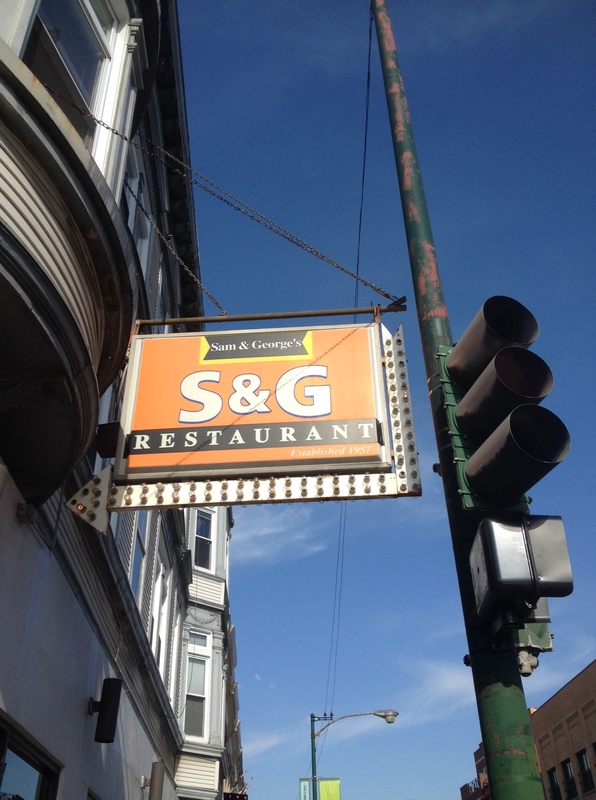 To be honest, I found the S&G owners to be rude especially the older gentleman. Not even sure he is still around, but many years ago when I was last there, I did not appreciate the attitude I received. In a city like ours, with so many great options, there is just no reason to patronize a business where owners seem unkind. 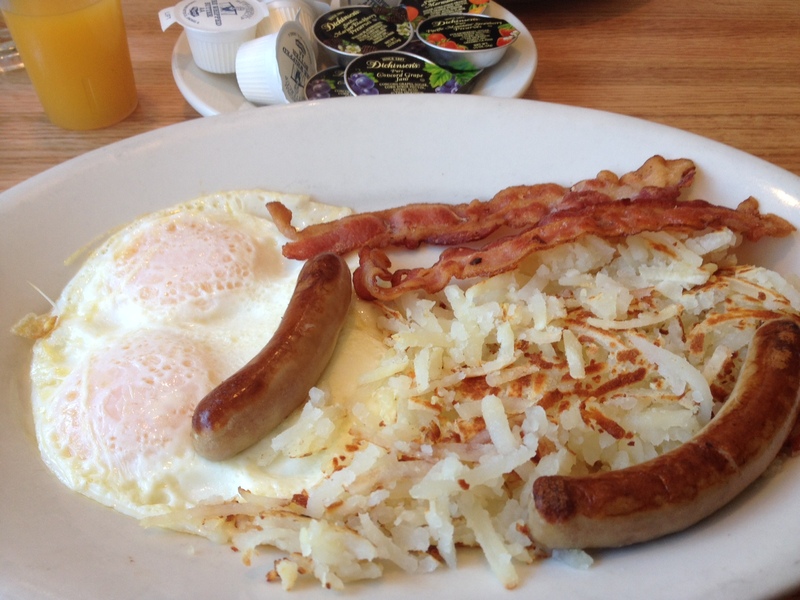 Check out the Golden Apple next time, they are always nice to customers and the breakfast can’t be beat!